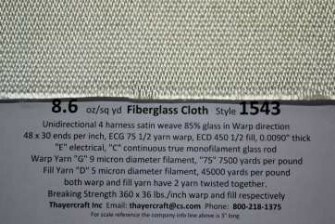 Style 1543 is a nice 4 harness satin weave unidirectional E-glass fiberglass cloth with about 85% of the glass in the warp direction. 1543 has a thread count of 48 x 30 ends/inch warp & fill respectively, uses ECG 75 1/2 yarn in the warp and ECD 450 1/2 in the fill and has a thickness of 0.0090". 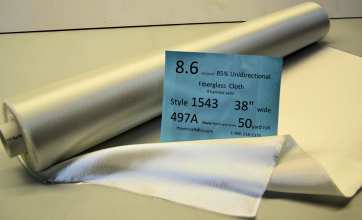 1543 38" is finished in 497A silane and is available in 10, 20, 30 and 50 yard rolls which are neatly rolled by us on 2" pvc.